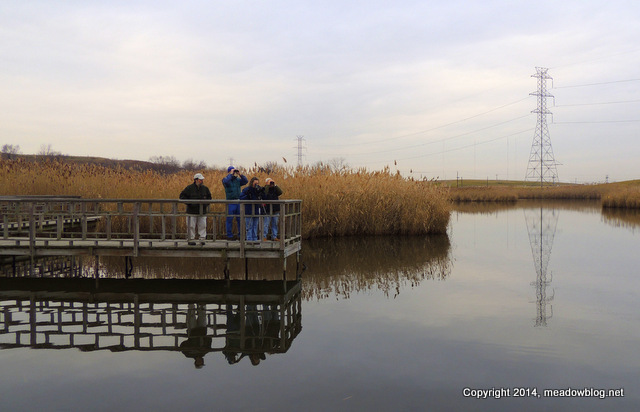 Don Torino, president of the Bergen County Audubon Society, has a new column about the joys of the outdoors this holiday season. I have always believed birders and all people that have made nature a part of their lives have an undeniable special connection to the natural world. Call it emotional or spiritual, divine or magical, either way I believe we all feel something very special when we spend time in the wild places we have come to love so much. No matter what is going on in this hectic and sometimes overwhelming time of year, there is no mistaking that a walk in the woods or the just the sight of a favorite bird makes us feel just a little better about the day. Keeping a Holiday connection to nature can make that time even more enjoyable and special. Our last walk of the season was overcast but warm, with lots of cool birds around. Highlights included 10 species of duck. They don’t call it DucKorte Park for nothing. Thanks to all who participated. See ya next year!! This video and the one that will be posted here tomorrow showcase the best nature had to offer us. I think you got quite a few stills from Ron, Roy, Chris, and others, so to compliment their awesome shots, here are the time lapse videos of those glorious skies at sunrise, sunset, and some in between when the skies were just awesome. In all, in the fall, I had over 30 minutes of TIME LAPSE material (extrapolated that’s about 200 hours worth of time spent on location with multiple cameras going at once, of course), with a whopping 120 individual sequences, that’s an average of about three per day, so what you see is only the best of the best. We’ll post the third video tomorrow.